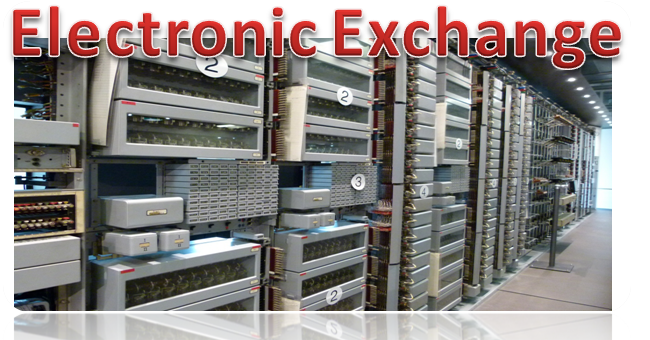 What are the Electronic Exchanges? What are the advantages and types of Electronic Exchanges? To overcome the limitations of manual switching; automatic exchanges, having Electro-mechanical components, were developed. Strowger exchange, the first automatic exchange having direct control feature, appeared in 1892 in La Porte (Indiana). Though it improved upon the performance of a manual exchange it still had a number of disadvantages, viz., a large number of mechanical parts, limited availability, inflexibility, bulky in size etc. As a result of further research and development, Crossbar exchanges, having an indirect control system, appeared in 1926 in Sundsvall, Sweden. The Crossbar exchange improved upon many short- comings of the Strowger system. However, much more improvement was expected and the revolutionary change in field of electronics provided it. A large number of moving parts in Register, marker, Translator, etc., were replaced en-block by a single computer. This made the exchange smaller in size, volume and weight, faster and reliable, highly flexible, noise-free, easily manageable with no preventive maintenance etc. 1.1 The first electronic exchange employing Space-Division switching (Analog switching) was commissioned in 1965 at Succasunna, New Jersey. This exchange used one physical path for one call and, hence, full availability could still not be achieved. Further research resulted in development of Time-Division switching (Digital Switching) which enabled sharing a single path by several calls, thus providing full availability. The first digital exchange was commissioned in 1970 in Brittany, France. This handout reviews the evolution of the electronic exchanges, lists the chronological developments in this field and briefly describes the facilities provided to subscribers, administration and maintenance personnel. Table 1 Chronological Development of Electronic Exchanges. 1972 D 10 Local and Transit NEC. Japan. 1978 AXE Local LM Eiricsson, Sweden. Category, Analysis, Routing, translation, etc;, done by relays. Any changes in facilities require addition of hardware and/or large amount of wiring change. Flexibility limited. Testing is done manually externally and is time consuming. No logic analysis carried out. limited facilities to the subscribers. Slow in speed. Dialing speed is max. 11 Ips and switching speed is in l milliseconds. Switch room occupies large volume. Long installation and testing time. Translation, speech path Sub’s Facilities, etc., managed by MAP and other DATA. Changes can be carried out by simple commands. A few changes can be made by Subs himself. Hence, highly flexible. Testing carried out periodically automatically and analysis printed out. Full availability, hence no blocking. A large number of different types of services possible very easily. Very fast. Dialing speed up to 11 digits /sec possible. Switching is achieved in a few microseconds. Much lesser volume required floor space of switch room reduced to about one-sixth. Short installation and testing period. Remedial maintenance is very easy due to plug-in type circuit boards. Preventive maintenance not required. 1.3 Influence of Electronics in Exchange Design. When electronic devices were introduced in the switching systems, a new concept of switching evolved as a consequence of their extremely high operating speed compared to their former counter-parts, i.e., the Electro-mechanical systems, Relays, the logic elements in the electromechanical systems, have operate and release times which are roughly equal to the duration of telephone signals to maintain required accuracy. However, to achieve the requisite simultaneous call processing capacity, it became essential for such system to have number of such electrical control units (Called registers in a Cross-bar Exchange), in parallel, each handling one call at a time. In other words, it was necessary to have an individual control system to process each call. Electronic logic components on the other hand, can operate a thousand or ten thousand times during a telephone signal. This led to a concept of using a single electronic control device to simultaneously process a number of calls on time-sharing basis. Though such centralisation of control is definitely more economical it has the disadvantage of making the switching system more vulnerable to total system failure. This can, however be overcome by having a standby control device. Another major consequence of using electronics in control subsystems of a telephone exchange was to make it technically and economically feasible to realize powerful processing units employing complex sequence of instructions. Part of the control equipment capacity could then be employed for functions other than call processing, viz., exchange operation and maintenance. It resulted in greatly improved system reliability without excessively increasing system cost. This development led to a form of centralized control in which the same processor handled all the functions, i.e., call processing, operation and maintenance functions of the entire exchange. In the earlier versions of electronic control equipment, the control system was of a very large size, fixed cost unit. It lacked modularity. It was economically competitive for very large capacity exchanges. Initially, small capacity processors were costlier due to high cost per bit of memory and logic gates. Therefore, for small exchanges, processor cost per line was too high. However, with the progressive development of the small size low cost processor using microprocessor, it became possible to employ electronic controls for all capacities. In addition control equipment could also be made modular aiding the future expansion. The impact of electronics on exchanges is not static and it is still changing as a function of advances in electronic technology. Many electronic switching systems, including the recent ones, had an electromechanical switching network and used miniature electromagnetic relays in junctors and subscriber line equipments None-the-less the trend is towards all electronic equipments for both public and private switching and the switching network has already been made fully electronic with the advent of digital switching.